Export of fresh potato crop has started and the volumes are likely to expand because of increased estimated output and strong foreign demand. Inquiries reveal that more than 10,000 tonnes of potatoes were shipped out over the last two weeks of December. Exporters say they have confirmed orders for supply of 20,000-30,000 tonnes in January, while expecting that total exports this year would cross 200,000 tonnes. In 2013, lower output in Iran amidst a bigger crop here had provided the potato exports in a big way, after a lull of two years. But export volumes had fallen short of the target of 200,000 tonnes chiefly for two reasons: Russia had initially bought Pakistani potatoes in small quantities and, later on, suspended imports on quarantine issues. And, there was no big demand in the region, except in Iran. Sri Lanka this year has provided Pakistan this kind of opportunity. �Had demand risen suddenly in a distant market, we won�t have been able to capture it. We�ve got lots of orders from Sri Lanka because the buyers there know that we can meet their demand quickly,� explained another exporter. Exporters are upbeat about prospects of potato exports this year because they expect that Russia would restart imports this month. A Pakistani delegation of exporters visited Russia in December to remove Moscow�s concerns and informed colleagues back home, the issue has almost been sorted out. About 200 people are associated with exports of vegetables and 50-60 of them have been exporting potatoes for some time. Whereas most exporters sell fresh potatoes abroad, a few are trying to capitalise on foreign demand for peeled and dehydrated potatoes as well, market sources say. Afghanistan, Iran, Iraq, Malaysia, Sri Lanka, Central Asian States, Russia and the UAE are major markets for Pakistani potatoes. Exporters say, in 2013 they explored Bangladesh and China adding that demand from Chinese markets still persist. �After a surge in exports of rice to China, we�re now expecting big increase in exports of fresh fruits and vegetables there. Potato tops the list of veggies in demand there,� says an official of Trade Development Authority of Pakistan. Exporters say demand for potatoes, particularly for dried potatoes, is on the rise from almost all importing countries and they are fully prepared to meet it. Most exporters, particularly the big ones, have lately started using modern facilities for processing before exports, market inquiries reveal. Some exporters, however, continue to cash in on occasional surge in demand for potatoes from India or Afghanistan (countries that are themselves big producers) by supplying the vegetables in bulk through land routes. 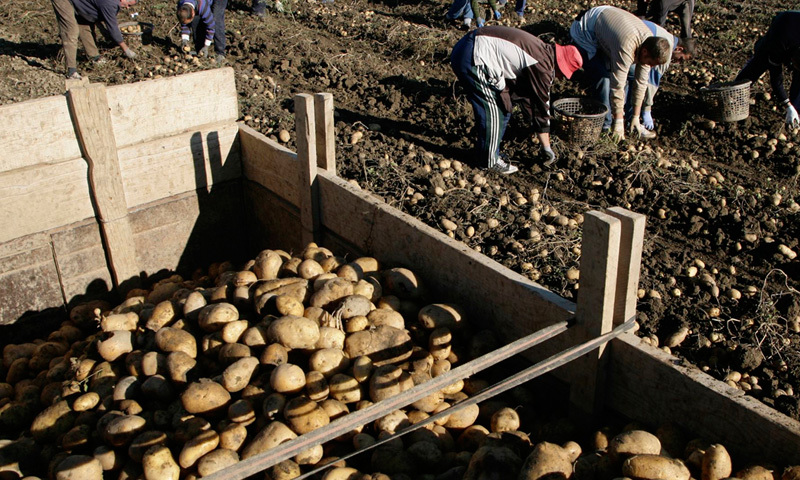 Primarily it was higher potato production in 2013 that gave boost to exports, officials in the Ministry of National Food Security and Research say. Final stats will trickle in after a few months, but initial estimates put last year�s output around four million tonnes, up from about 3.5 million tonnes in 2012. Progressive farmers in Punjab and Sindh say output this year will also be no less than four million tonnes and cite early maturity of the crop as an indication. In the past two decades, potato production has generally progressed well, except on one or two occasions as in 2012 when Pakistan had to import 50,000 tonnes of this most common vegetable, mainly from India and Afghanistan. Agricultural stats compiled on fiscal year basis show that between 1995 and 2000, average production of potato stood around 1.43 million tonnes, rose to 1.86 million tonnes between 2001 and 2005 before shooting up to 2.55 million tonnes in the next five years. Farmers say, and official stats confirm that production has been on the rise both due to increase in the area under cultivation and average per hectare yield. They say that wider use of two new seed varieties, one for white potatoes and the other for the red ones, have contributed to higher production in recent years. These varieties, registered in Faisalabad in 2004, along with a couple of other varieties developed in 1990s had taken the per-hectare yield up to 22.7 tonnes in 2009-10 but the rising trend somewhat faltered later on.